President Barack Obama flew to Kenya, where his father's side of the family is originally from, to speak to the country about its future on Sunday, according to the Associated Press. Obama is the first U.S. president to ever visit Kenya, as well as the first Kenyan-American president. His speech to the people emphasized their need to avoid corruption in government and give attention to civil rights, such as LGBT rights and women's rights. 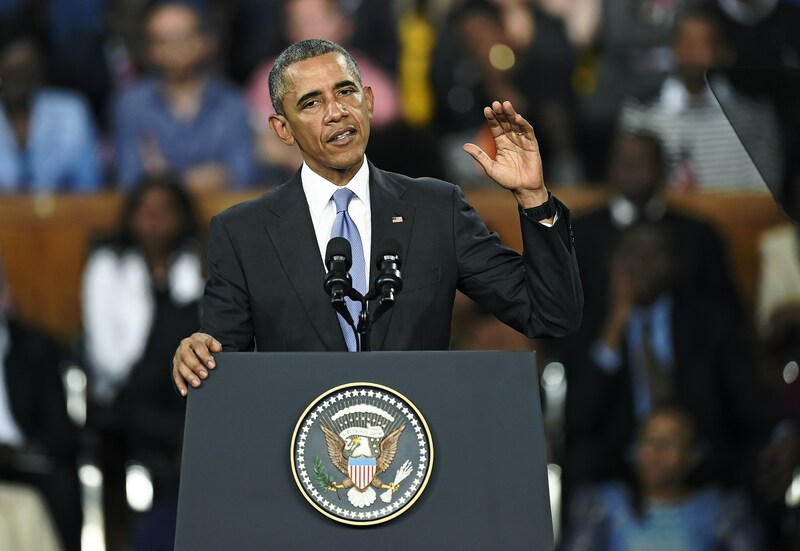 Obama's greatest quotes during his speech in Kenya show that he has true faith in the future of the country, but that it can't shy away from serious issues that need change. Obama encouraged Kenyans to "choose the path to progress" by dealing with corruption, tribal conflict, terrorism, the need for better education and health care, and equal treatment for women, the AP reported. Obama said that young Kenyans no longer have to serve a colonial master or leave the country, like both his father and grandfather had to, according to BBC News. "Because of Kenya's progress, because of your potential, you can build your future right here, right now," he told the audience. To build that future, though, Obama said the country needs to deal with the "cancer" of corruption that is costing it 250,000 jobs and barbaric practices like female genital mutilation that are holding back women. Here are six of the best quotes from his speech. Africa is on the move. Young people ready to start something on their own: That's entrepreneurship. It's the spark of prosperity. It helps citizens stand up for their rights and push back against corruption. You don't have to look a certain way or have a certain last name to have an idea. A politics that's based on only tribe and ethnicity is doomed to tear a country apart. It is a failure — a failure of imagination. Every country and every culture has traditions that are unique and help make that country what it is, but just because something is part of your past doesn’t make it right, it doesn’t mean it defines your future. Around the world there is a tradition of oppressing women and treating them differently and not giving them the same opportunities, and husbands beating their wives, and children not being sent to school. Those are traditions. Treating women and girls as second-class citizens. Those are bad traditions: they need to change. Treating women as second-class citizens is a bad tradition: it holds you back. There’s no excuse for sexual assault or domestic violence, there’s no reason that young girls should suffer genital mutilation, there’s no place in a civilized society for the early or forced marriage of children. These traditions may go back centuries; they have no place in the 21st century. They are issues of right or wrong in any culture. But they are also issues of success and failure. Any nation that fails to educate its girls or employ its women and allow them to maximize their potential is doomed to fall behind the global economy. We’re in a sports center: imagine if you have a team and don’t let half of the team play. That’s stupid. That makes no sense. When you start treating people differently not because of any harm they are doing to anybody, but because they are different, that's the path whereby freedoms begin to erode. And bad things happen. And when a government gets in a habit of people treating people differently, those habits can spread. As an African-American, I am painfully aware of what happens when people are treated differently under the law.